*Editor’s Note* – Below is Part IV of seven parts of email exchanges by Jet Ferebee to USFWS Director Ashe exposing corruption and poor red wolf and wildlife management in parts of North Carolina. You can find Part I, Part II, Part III by following the associated links. Since I have been investigating the USFWS red wolf program, your biologists have ceased publicly updating their reports and I do not really blame them. 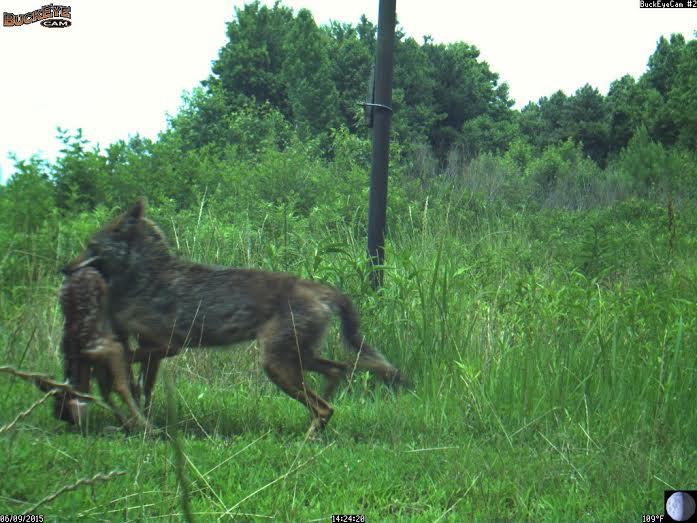 One of the last reports showed that eight out of seventeen or 47% of the known red wolf packs in NC contained coyotes. I have previously proven USFWS has no idea where or what is happening with the vast majority of their red wolves. One can only assume the large unknown and unmanaged wolf population has a much higher occurrence of coyotes and consequential hybridization. In 1999, the Red Wolf Recovery Implementation Team documented the hybridization rate of wild wolves in our state was 900% more than allowed for the program goal of 80% to 90% genetic integrity to be maintained and the red wolf breed would be unrecognizable within 2 to 3 generations. I bring this fact up because you are obviously having a difficult time determining exactly what species this pictured canine is and I felt you should understand why. In January the NCWRC unanimously passed the below resolution demanding that USFWS immediately remove all illegally released wolves and their offspring, which would include the above pictured canine. Almost five months after this request from our State agency charged with protecting our native wildlife, USFWS has done absolutely nothing. If I had ever done something as atrocious as what USFWS has done in eastern NC, I would have been doing everything possible to immediately rectify the situation. Not so with USFWS. As Director of USFWS, do you believe USFWS’s handling of the red wolf scandal in our State bodes well for future USFWS programs where cooperation with State wildlife agencies and private landowners is so critical? When exactly will you begin removing your illegal wolves and their offspring from NC? What Kind of Wild Cross-Bred Dog Am I? USFWS Red Wolf Corruption or Incompetence?